From the makers of the 2 highest-grossing indie Filipino movies, "Ang Lalake sa Parola" and "Ang Lihim ni Antonio", comes a new digital film about rediscovering one's self through a picturesque journey of four friends. They face their fears from the past and come to terms with who they really are and what they really want. “Kambyo” is the latest collaboration of Digital Viva and BeyondtheBox, written by Lex Bonife and directed by Joselito Altarejos. Starring Harold Macasero (AnnaKarenina), Ray An Dulay (Bathhouse), Johnron TaÃ±ada (Hubad), Gabz del Rosario and Kenjie Garcia (Ang Lihim ni Antonio). Itâ€™s the last summer of their university life. Cousins Macky (Rayan Dulay, Bathhouse) and Manuel (Kenjie Garcia, Ang Lihim ni Antonio) start on a road trip to look for the Mackyâ€™s long lost friend Philip (Johnron Tanada). They bring along with them their fun loving friend Xavier (Harold Macasero), who tags along a hunky guy named Aldo (Gabz del Rosario), whom he just met right before their trip. As the engine of Mackyâ€™s old van begins to accelerate, their relationships start on a new journey. Love blooms. Secrets unfold. Insecurities collide. And hidden desires set in. 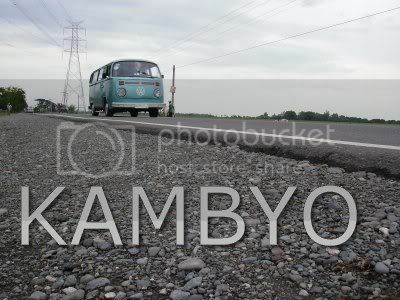 Kambyo is set to premiere on June 26, 2008 at the UP Film Institute. Regular showing begins on July 9, 2008 at Robinson’s Indie Sine.